When filling by weight, propane re-fillers look for two very important things prior to hooking up the fill hose with the cylinder on the scale. These two things are the water capacity and tare weight. The water capacity is how much water the propane tank will hold in pounds. For example, the “WC” stamped on the tank followed by a number such as “47.6” means the tank will hold 47.6 pounds of water. The tare weight (empty weight) indicated by “TW” is also followed by a number such as “18” meaning the tank weighs 18 pounds when empty. The numbers here would likely be found on the collar of a 5 gallon propane tank (also known as a 20 pound cylinder) used for a barbeque grill. The tank filling station will generally have a cylinder filling chart that converts water capacity (WC) to pounds of propane that the filler will refer to before filling the tank. D.O.T. regulations limit propane fill levels not to exceed 42% of the water capacity of the tank. A typical gas grill tank holds 47 pounds of water, which converts to 19 3/4 pounds of propane. In other words, a propane tank that will hold 47 pounds of water will hold a safe-fill maximum net weight of 19 3/4 pounds of propane. 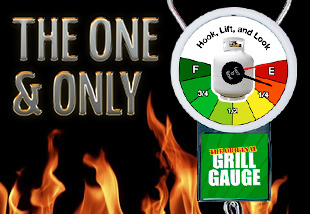 How does the Grill Gauge help?